Nestled along the sugary Florida coastline of Longboat Key is a Florida beach resort. This family-friendly beach resort pairs the unbelievable views of sunsets, sunrises, sand and surf with all the amenities of a hotel double the price. This affordable and family-friendly beach resort – Casa Del Mar, will be an annual trip for years to come. We love the white sandy beaches of the Florida coastline on Longboat Key Beach. This is exactly why I booked it for my family’s latest Florida beach vacation. It’s everything I’ve been searching for – and more! This home away from home pairs the incredible, unbelievable views of sunsets, sunrises, sand and surf with all the amenities of a hotel double the price. This resort is right in the middle of the vacation spectrum – tranquil enough for those vacationers seeking relaxation, but close enough to fun and excitement – both on-site and nearby – to satisfy every adventurer in the family. Yes, this resort even entertains the hard-to-please kids! 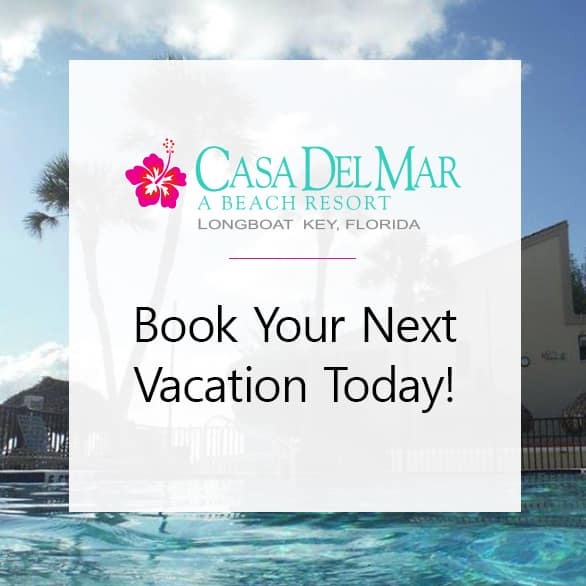 I almost didn’t believe it when I read it, but take it from regular guest Ron Eydenberg, Casa Del Mar “is a slice of paradise.” Eydenberg and his children (who are now grown and bring their families to vacation here) enjoy the Florida resort year-after-year – and I can see why they are drawn back. Here are the many reasons why the Eydenbergs love the resort. The in-room amenities are boundless. The furnishings – both in the living area and bedrooms – were comfortable and resemble the coastal aesthetics of the area. Stay connected to the outside world through the multiple TVs with free cable and wireless internet. Completing the running list of incredible benefits of staying at this Florida resort, the pièce de résistance – the beach. The pristine white sand is unadulterated by rocks or trash, which you might find at other beaches. But not Longboat Key. There are a plethora of water activities, from adrenaline-pumping to relaxing, just minutes away from the resort. Book a dolphin or sightseeing cruise to enjoy views of Sarasota Bay in a tranquil setting. Go scuba diving to explore what lies under the waves. Windsurfing, jet skiing, parasailing, paddleboarding – the possibilities are endless. This in-depth beach lovers guide was so helpful when narrowing down all the fun in the sun that can be had on Longboat Key Beach. Of course, a visit to the Circle would not be complete without a trip to The Ringling, or The John & Mable Ringling Museum of Art. The area has a special connection to John Ringling – the circus magnate purchased St. Armand’s Key in 1917 and developed it for commercial and residential purposes. Casa Del Mar is such a popular Florida beach resort, that it has garnered attention from the world-renowned magazine Condé Nast Traveler, landing on its Gold List as one of the best places to stay in the world.